Would you like to redesign your bathroom with a style that is unique? If so, get in touch with the experts at Stile IT today. Our original bathroom tile design in Southampton will leave you with a bathroom that screams you. Don’t settle for old worn tiles, treat yourself today with Stile IT. 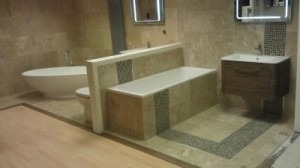 At Stile IT, we are widely regarded as the best bathroom specialists in the South. Our bathroom tile design service in Southampton is without a doubt the best around and is guaranteed to deliver the best results at prices that are affordable. There is nothing worse than cracked tiles or tiles that look out of place – if you’re contemplating having any work done, get in touch with Stile IT and see what we can do for you. From domestic customers to commercial clients, our team can tackle bathrooms of all shapes and sizes. Thanks to our unrivalled attention to detail, we can recommend professional styles that will suit traditional, contemporary and modern bathroom suites. Get in touch and we will talk to you about your requirements and offer solutions tailored to your available budget. From floors to walls, whatever you envision, at Stile IT, we can provide it. Once we have finished creating your FREE bathroom tile designs, we will supply you with a no-obligation quote with all costs upfront and no hidden charges. Should you be satisfied, our Southampton tilers will proceed with fitting your tiles ensuring that all work is completed to a high standard. At Stile IT, we are confident in the quality afforded by our original bathroom tile design in Southampton. Our professional service will ensure tiles that will shield the underlying floor or wall from water spillage while providing an aesthetically pleasing finish that will last for many years. Should you encounter any issues with your tiles, however, get in touch as we will be more than happy to put everything right. If you are looking for the most prestigious bathroom tile design in Southampton, look no further than Stile IT. Over the years, we have built an excellent reputation with our clients that has led to many fantastic referrals. Our dedication to exceeding your expectations is what drives us, and we are always looking for ways to improve the services that we offer. As a company, we strive to be as competitive as possible and frequently compare our prices to those offered by rival Southampton bathroom tile design companies. When you enlist Stile IT, you will have complete peace of mind with our two year workmanship guarantee and five year product guarantee. Get in touch with the expert tilers at Stile IT and book your original bathroom tile design in Southampton today. Contact us on 02380 633966 to discover more about what we offer.